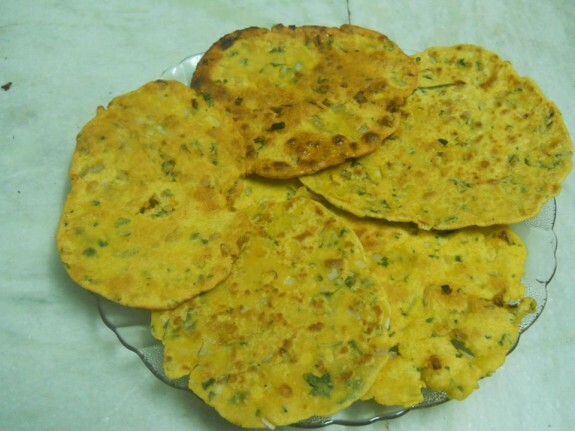 The Thepla is special dish from the state of Gujarat which is prepared from wheat flour or gram flour, fenugreek leaves (methi) and some other spices. You can enjoy this food with Raita, curd or pickle or chutney. 1. Take a big bowl and add wheat flour, gram flour, turmeric powder, red chilli powder, salt, coriander powder, carom seeds, chopped fenugreek leaves, 2 tsp oil and curd and mix everything well. You can add some water to knead soft dough. Cover the dough and keep it aside for 20 minutes. 2. After 20 minutes, grease some oil in your hands and knead the dough properly until it becomes smooth. 3. Preheat a skillet. On the other side, take little mount of dough (same like size of lemon) and roll it to make it a round shape. Dust the ball with some dry flour and roll it thinly of about 6-7 inch diameter to give it a paratha shape which is called thepla. 4. Grease the preheat skillet with some oil and place the rolled thepla over it. While it will turn dark in colour, then flip the other side and spread some oil on the upper surface. Do the same process with both the side of the thepla by flipping it. 5. Roast the thepla on medium low flame until it gets brown from both sides. Your thepla is now ready to eat. Make other theplas with the same process. Serve your Thepla with Curd, raita, pickle, chutney or any vegetables you like.